Two weeks ago, at the warm invitation of Samoa Tourism Authority, my wife and I attended several events of Miss Pacific Islands Pageant including graceful Chairperson’s Reception at the beautiful Taumeasina Island Resort against the backdrop of the magnificent sunset on the sea , the hilarious floral float in front of government building where people from various villages showcased their wonderful floats decorated in traditional style as well as the grand finale of the Miss Pacific Islands Pageant at Gym 1 of Tuanaimato Complex. We were very happy to attend all these events because this is a very different beauty pageant from other pageants that we have known of. As Prime Minister Tuilaepa said, “The Miss Pacific Islands is a‘Pageant with a Difference’as it is one of integrity that concentrates on the promotion of our Pacific ladies’ positive attributes, diverse cultures and beautiful countries”. More importantly, this year happens to mark the 30th anniversary of Miss Pacific Islands Pageant. At this important junction where people are celebrating history and embracing future, it is with great satisfaction to see that the efforts has always been there to promote and sustain the diverse cultures of the beautiful Pacific island countries. We marvel at the 30-year tradition of Miss Pacific Islands Pageant not only for it being a platform for young intelligent women to manifest their talent, wisdom and willingness in assuming responsibilities for publicizing awareness for both regional and global issues of common concern, but also for it being a grand celebration of culture of Pasefika. 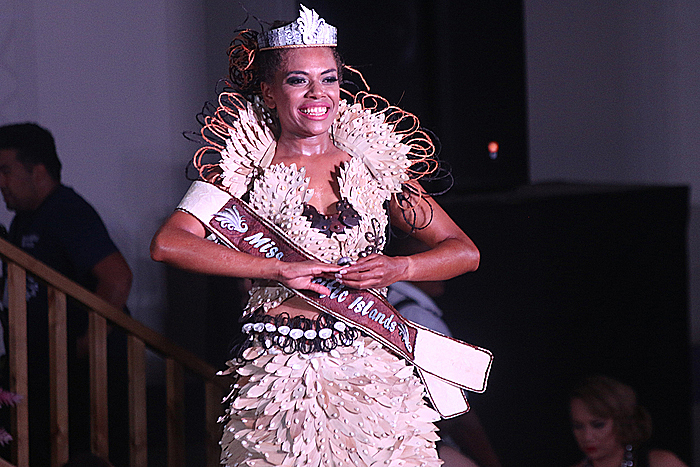 Therefore, “culture” is definitely one of the most important elements in Miss Pacific Islands Pageant. We experienced culture in the traditional wears of the young ladies representing different countries in Pacific island countries, in their songs and dances and speeches which further enhanced the charm and beauty of those traditional wears as well as in their faith and strong belief in traditional values that have governed the lives of Pacific people for thousands of years. The traditional wears are so uniquely beautiful in that they are the embodiment of the culture of the respective countries. For example, we saw many traditional elements in the making of the traditional wears such as fine mats, shells, pearls, feathers, sea grass, fibers from plants which have been used by Pacific people generation after generation, only in a much more stunning way. In fact, these are the stunning carrier of Pacific culture. The songs and dances are another carriers of culture because they, most of time, are the simulation of the daily work and life of people who have lived on this land generation after generation. On top of that, traditional values are at the core of culture because they are the roots of people and “they grow to build our character” as said by Miss Abigail Havora, the former Miss Pacific Islands. We were very touched by the Farewell Speech by Miss Havora at the Finale of Miss Pacific Islands Pageant and here I quoto,“My root taught me to honor God, to respect my elders and that integrity weighed more than deceit; my roots taught me that family is the foundation of love we are born into, the type of love that shares in the sorrow and joy, the type of love not limited to bloodline; my roots taught me that the values embedded in our lives from a child keep us grounded through the storms of life and the vast ocean we cross.”As Miss Pacific Islands who is supposed to represent thousands of islands and dozens of nations, she did not have “to visit the entire region to be fit to represent”, instead, she just returned to the values that people share as a region, the core of all diverse cultures of the region. So, this is power of culture. Discovering culture is discovering oneself, one’s own identity; embracing cultures is embracing people who share values in common with you and those values are in fact universal values of all people in the world. Last month, 20 participants from Samoan government sector, art institute and private sector attended the three-week “2016 Seminar on Culture and Art” was sponsored by China’s Ministry of Commerce in Beijing and Guizhou Province of South-western China. After they came back from their trip to China, they were invited again to Chinese Embassy to share their experiences in China as well as what they had learned during their stay in China. All the participants of the seminar recalled with great pleasure their happy and rewarding training in China during which time they have not only witnessed with their own eyes the profound Chinese history and culture and the remarkable achievements of social and economic development, but also the gracious hospitality and the utmost politeness of the Chinese people. Several wonderful presentations were given by Samoan participants respectively on “Protection of Cultural Heritage”, “Cultural Tourism and Development of Cultural Industry”, “Comparison of Songs and Dances between China and Samoa” and “How to Achieve Prosperity through Developing Cultural Industry”. I was very impressed by the participants’ thoughts on understanding Chinese culture and comparison of Chinese culture with Samoan culture. They found to their great amazement that Chinese people are so family-oriented, hospitable, hard-working, filial to their parents, which are values that Samoan people also hold; they found the patterns and designs of many handicrafts of Chinese Miao ethnic group are so similar to what they have in Samoa; they joined the Mongolian folk dance with Chinese dancers spontaneously when in Beijing Dance Academy; they played drums rhythmically in great harmony with the man who sells drums in one of the most popular historical and cultural towns in Guizhou Province; they sang heartily together with the Great Flower Chorus of Pu’an County as if they have been always in the Chorus. They found so many things that they are familiar with and, of course, many other different things that they are so attracted by. One thing is certain that they felt so at home in China even though it is the first time for many of them to go to China, a country tens of thousands of mile away from Samoa. So, again, this is power of culture. These Samoan participants discovered those values that Chinese people hold dear to their hearts are also at core of Samoan culture. It is these universal values that bring people’s hearts together, no matter where you come from. When Moana was screened in Apollo Cinema about two weeks ago, my colleagues and I went there to see it with great delight. We heard about it from many of our Chinese friends who can’t wait to see this wonderful Disney animation with unique Polynesian cultural style. I believe Moana surely plays a very important role in attracting attention from views of all over the world to Pacific island countries including Samoa, not only for its breath-taking natural beauty, but also for the uniquely charming culture that people have been living for thousands of years. Culture is way of life, culture is one’s identity. That’s the power of Culture.